It was a well-circulated Washington Post headline in December, but it could have been the tagline for the March 18 Francis Factor event held at Loyola University Maryland in Baltimore. As a cardinal, archbishop and four Catholic expert panelists shared insights from Pope Francis’ first year, they repeatedly shifted the attention away from the pope and onto the Son of God. Pope Francis would have done no less. “The pope is a true companion of Jesus,” said Cardinal Seán P. O’Malley, a Capuchin Franciscan and archbishop of Boston, in the evening’s keynote address. Speaking to an audience of some 2,800 in Loyola’s Reitz Arena, Cardinal O’Malley said the pope is enticing people to take a new look at the church. The Francis Factor was hosted by the Archdiocese of Baltimore, part of its 225th anniversary celebration. The evening included an introduction from Baltimore Archbishop William E. Lori, the address from Cardinal O’Malley, and by remarks followed by a question-and-answer session from four panelists: Basilian Father Thomas Rosica, founding chief executive officer of the Canadian Catholic network Salt and Light Television; Jesuit Father Matt Malone, editor-in-chief of America magazine; Helen Alvaré, professor of law at George Mason University School of Law in Arlington, Va., and a consultor for the Pontifical Council of the Laity; and Kerry Robinson, executive director of the National Leadership Roundtable on Church Management. Baltimore’s Catholic Charities, Catholic Review Media and the Catholic Community Foundation of the Archdiocese of Baltimore also supported the two-hour event. To view a slideshow from the event, navigate the arrows below. See a photo you like? 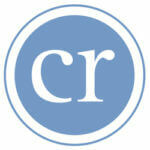 View the Catholic Review Smugmug gallery for purchasing options. 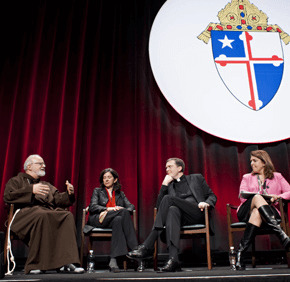 Wearing his brown Franciscan habit, Cardinal O’Malley framed his remarks with the connection between St. Ignatius of Loyola and St. Francis of Assisi. Ignatius read about St. Francis, and the friar’s example of self-denial and heroism played an important role in Ignatius’ conversion and founding of the Jesuit order. Pope Francis can be understood not as a Jesuit who leans Franciscan, but as a fully Ignatian Jesuit, Cardinal O’Malley said. He pointed to the pope washing the feet of young people, including young women, in a detention center on Holy Thursday. Catholics used to experiencing a stylized feet-washing ritual were surprised to see the pope in such a humble role before the youths. Like Pope Benedict XVI before him, Pope Francis says Catholicism is not a catalog of prohibitions, the cardinal said. The Francis Factor Recorded on 3/18/14 from Michael Address on Vimeo. All of the evening’s speakers expounded on Pope Francis’ love for the poor and his call for mercy. Father Malone said some Catholics run the risk of “being religious, but not spiritual” and viewing truth as an idea, not the person Jesus. Alvaré focused on Pope Francis’ call for women to assume a greater presence in the church. For a blueprint of how that might look, she said, one only has to look to Pope Francis. His relational and familial approaches reflect “women’s capacity to put other people at the center of the universe,” she said. “It is the Marian face of the church, and the world’s over-the-top reaction to it is a striking indication of the need for it,” she said. She cautioned that there might be a temptation within the church to admire and value the contributions of women in theory, but not in fact. Robinson also spoke of Pope Francis’ call for women’s leadership, which should arise “not for the sake of women, but for the sake of the church.” She said Catholics would benefit from reflecting on the role of St. Clare, who formed a women’s religious community to participate in St. Francis’ work. Father Rosica said it is possible for people to get hung up on the externals of Pope Francis’ ministry – driving a Ford Focus, wearing simpler garments, making a jam sandwich for a member of the Swiss Guard protecting his apartment – and miss the heart of the message. He pointed to the message that St. Francis received from God: “Rebuild my church.” At first, St. Francis took it literally, but later understood it figuratively, as a calling to serve others, especially the poor. Pope Francis is doing the same thing today, Father Rosica said. “The most important ‘Francis factor’ is the invitation to all of us to be Christ-like in the way that he is and collectively encounter the poor, not just be aware of the poor or work on behalf of the poor … and thus be transformed ourselves,” Robinson said. The most important achievement of Pope Francis’ first year, which celebrated its anniversary March 13, is that he has “re-branded Catholicism and the papacy,” Father Rosica said. Such seemed to be the case for an audience member, who addressed the panel during the evening’s question-and-answer session. A Loyola student who implied he is gay said he was raised Catholic but felt pushed out of the church. Pope Francis made him feel like he might have a place in the church again. Father Malone confirmed that Pope Francis does not intend to change the church’s doctrine, but said not to discount the power of his shift in tone. Instead of tacking on that teaching to conversations about human sexuality, Catholics should lead with it, Father Malone said. “If we are to envision a church in which everyone is welcome, we have to start there,” he said. Other questions were submitted online and involved evangelization, church finance responsibility, and economic policy. One questioner asked how to channel the pope’s celebrity into Catholic action. “He quite simply walks the walk,” he said.